There’s no part of your home which is more integral to the ongoing comfort and safety of your family as the roof and when damage occurs, from a single shingle falling from place to an entire portion of the roof collapsing due to a falling tree branch, it’s crucial that you get in touch with your local Next Level Exteriors roof repair Oklahoma City, OK specialists as soon as possible. 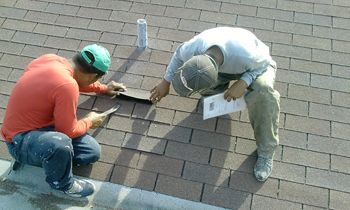 Oklahoma City roof repair services are a highly specialized service option and when they aren’t efficiently and professionally addressed they can quickly lead to structurally-threatening and life-threatening conditions. If you’re interested in learning more about what Next Level Exteriors can do for your home’s reliability, safety, and comfort for many years to come then there’s no better time than now to call our friendly and knowledgeable Oklahoma City roof repair contractors at (405) 241-4887. Whether you’re in need of emergency services today or simply want to learn more about weak points that are worth keeping an eye on, our friendly and knowledgeable representatives are available right now to provide you with the precise services you need to feel comfortable and confident about going home to your home.